"[Chengdu GaStone, placed on the list of foreign companies requiring a special export license in 2014] due to its involvement in activities contrary to the national security and foreign policy interest of the United States -- specifically, that it had been involved in the illicit procurement of commodities and technologies for unauthorized military end use in China." 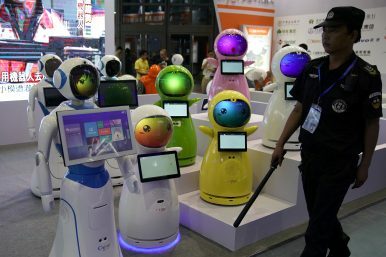 "China is no longer in a position of technological inferiority but rather sees itself as close to catching up with and overtaking the United States in Artificial Intelligence [AI]." A security guard walks past robots at 2017 China International Robot Show in Shanghai, China (July 5, 2017). On January 23 a press release issued by the U.S. Department of Justice charged two naturalized American citizens from Taiwan and Vietnam Yi-Chi Shih, 62, and Kiet Ahn Mai, 63, with conspiracy to pose as domestic customers for the purchase of computer chips from an American company (unnamed), to then export the chips to a Chinese company by the name of Chengdu GaStone Technology Co. The men made no effort to obtain the licence required to export the chips. These chips are monolithic microwave integrated circuits, used in electronic warfare and radar systems. The unnamed American company's clients include the U.S. Air Force, Navy and the Defense Advanced Research Projects Agency. Obviously, the use of these specialized chips from its U.S. manufacturer would go some way to compromising its American clients. The scheme as it was revealed involved the funnelling of money to buy the chips from Chinese entities to the Los Angeles-based Pullman Lane Productions, LLC linked to Yi-Chi Shih as owner. Kiet Ahn Mai's own company, MicroEx Engineering was to act as a customer ordering and paying for the manufacturing of the chips. Yi-Chi Shih then undertook to illegally export them to ChengduGaStone in China. Canadian press reported on January 25 that Ishiang Shih, an engineering professor at McGill University and a Canadian citizen, who happened to be Yi-Chi Shih's brother to have been involved in the case. Money transferred from Yi-Chi Shih to a company in Canada registered in his brother's name led to the brother receiving a mailed shipment connected to the case, according to a report by the Montreal Gazette. Yi-Chi Shih's travels had been tracked by American authorities to reveal trips to Montreal and China during a ten-year period. Investments in military technology has for decades been of utmost importance to the Chinese regime, where in December of 2017 the Chinese navy tested an advanced aircraft carrier using semiconductor technology from a British company it had acquired a decade earlier. This is China's enterprising way to acquire technology pioneered by other countries, through the acquisition of the companies developing them. China had announced its ambitious goal to become the world leader in artificial intelligence, outlined in November 2017 through a report by the Center for a New American Security. It plans to gain an advantage over the technical progress of the U.S. through AI technology in the modernization of its military. The People's Liberation Army Daily on January 25 announced its recruitment of over 120 researchers from the military to staff the Academy of Military Science to develop "top-rated" military technology. Researchers have been brought in specialized in fields such as unmanned smart equipment and quantum technology. The timeline is to continue until 2030, when the Communist regime in Beijing has engineered itself to become recognized universally as the world's top innovator of artificial intelligence.